Why Are Omega-3’s important during pregnancy? You’ve probably heard that DHA and it’s omega-3 cousin, EPA, are important for pregnancy. Why? Those healthy fats are the building blocks of cell membranes and are needed for your baby’s brain and eye development. Unfortunately, most of us don’t get enough in our diet. Unfortunately, many women have gotten the wrong advice about eating seafood while pregnant. Some women have been told by their doctors to avoid seafood altogether, while others are eating fish that don’t have enough DHA/EPA. So what types of fish should you be eating? I’m glad you asked, because I’ve got the info right here! The chart below outlines the top choices for you and your baby. Mercury and other environmental chemicals can affect neurodevelopment and cause lots of problems for you and your baby. That’s why it’s important to choose your seafood carefully. The fish on the chart above are very low in mercury and other chemicals you want to avoid while pregnant. How to choose other safe seafood? Use this wallet card from Dr. Charles Santerre, Food Toxicologist from Purdue University: Fish4Health.net. Also at the website, you can link to local fish advisories in every state. Local rivers and lakes can be polluted to the point that you should eating fish from there if you’re pregnant. The next challenge to eating seafood is knowing how to cook it. My personal favorite from the list is salmon. It’s versatile, always available and it’s on the menu of many restaurants. One easy way to cook it: squeeze lemon juice, sprinkle of dill and cook covered in a glass dish in the microwave. This recipe from LivelyTable can also be done in the microwave. I also like to marinate salmon in lemon juice, olive oil, garlic and herbs and grill it. 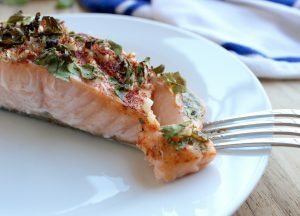 Find more recipes here> Healthy Seafood Recipes for Pregnancy & Beyond! Leftover fish is also great leftover on a salad! What About other chemicals in seafood? PCBs, dioxin and other chemicals do find their way to the water, unfortunately. Here is where seafood eating advice is controversial. Fish can absorb persistent organic pollutants or POPs from the ocean. 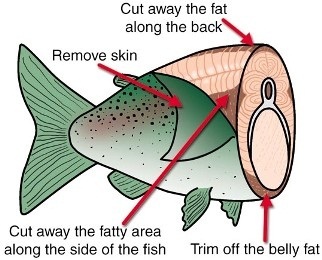 While concerning, this should not keep you from eating seafood. You do need to be choosey about fish and also, cook with care. Smaller fish are at the bottom of the food chain, and thus have less pollutants. Great things do come in small packages–sardines and anchovies get an A+ here. Is it worth it to eat fish even if we know it has some environmental chemicals stored in the flesh? Yes, says the research. 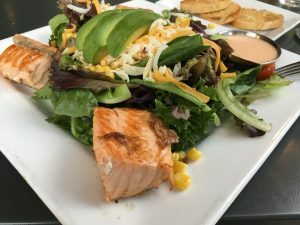 In a 2015 review of eight studies in the journal Nutrients, authors summarized: “the benefits of diets providing moderate amounts of fish during pregnancy outweigh potential detrimental effects in regards to offspring neurodevelopment. It is important that the type of fish consumed is low in mercury.” You can read the entire article here. If you are vegan or don’t eat fish, you can also get the long-chained omega-3 from a vegan source–microalgae. There are several sources of vegan DHA on the market–he re is one that has the cleanest ingredient list I’ve seen! While vegetarian sources of alpha-linolenic acid like chia seed, flax seed, hemp seeds and walnuts are also great to have in the diet, they are not efficiently converted to the long chain fats DHA and EPA. So there you have it. You should eat seafood if you are pregnant–or you should consider taking a vegan form of DHA. If you’d like more information, check out my post, Should You Eat Fish While Pregnant. « Steelhead Trout with Jicama Slaw–Great Leftover!